Patch the Sky teeters between the crisp production and outright aggression that marked Mould's short tenure fronting Sugar. With rumors of a Hüsker Dü reunion circulating last fall after what amounted to domain spotting akin to Radiohead registering a new legal entity, Bob Mould put such a notion to rest when announcing his latest album, Patch the Sky. Pointing out the website in question is simply a merchandising arm for the revitalization of his former band's brand, Mould told Stereogum this January: "I got my life over here, man. I never want to take advantage of the fact that I was in that band." Dreams of Mould, Grant Hart and Greg Norton reconvening after nearly three decades now dismissed, fans of Mould should fondly recall Sugar, the trio he formed with David Barbe and Malcolm Travis in the early 1990s, when considering Patch the Sky. Having toured in 2012 behind the solo album Silver Age, his first fronting the trio that includes Jason Narducy (Verbow, Split Single) and Jon Wurster (Mountain Goats, Superchunk), Copper Blue -- Sugar's 1992 debut -- was performed in its entirety. Opening Patch the Sky, lead single "Voices in My Head" is a direct descendant of 1992's "Hoover Dam", Mould's stock duality of "I'm on the centerline / Right between two states of mind" replaced nearly a quarter-century later by "No more time to listen / To the voices in my head … If I decide to listen to myself." Those familiar with Sugar's catalog will note the use of backmasking, the keyboards of "Hoover Dam" replaced by guitar on "Voices in My Head". Whereas Sugar was always meant to be a band (see: "Company Book", Barbe's contribution to 1994's File Under: Easy Listening and his sundry tracks included on the 1995 compilation Besides), Patch the Sky -- Mould's third outing with Narducy and Wurster -- sounds more like a democracy. Tearing down Mould's wall of sound, the black hole of "Losing Sleep" is propelled by the groove set forth by the song's drums, bass and synths. Locked in, the trio thrashes together an impenetrable defense on the spiraling "Black Confetti". Those wishing for early Hüsker Dü can relish in the speed and melodicism of "Hands Are Tied" and "Losing Time", while the go-for-broke "Lucifer and God" finds Mould's handcuffed guitar relegated to rhythm section. As if addressing those pining for decades past, closer "Monument" serves as a not-so-subtle mile marker as to where Mould currently stands: its slow build and anthemic chorus owing more to recent benefactor Dave Grohl's Foo Fighters than any of Mould's historical iterations. 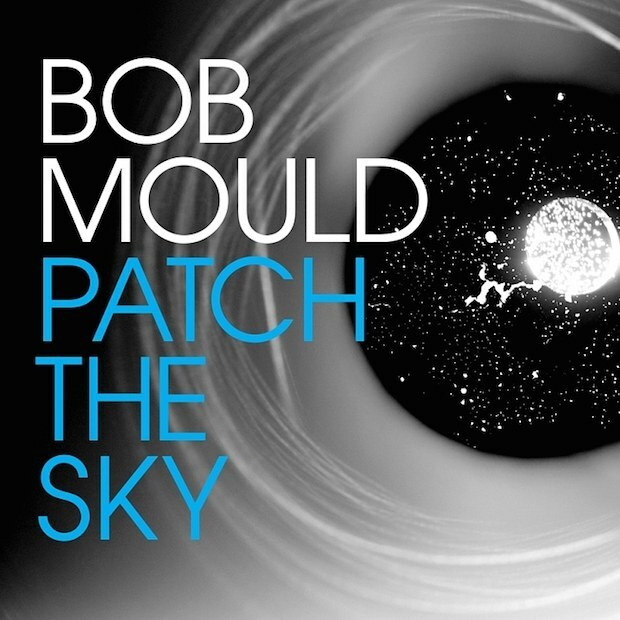 Dealing a hot hand since Silver Age, to call Patch the Sky yet another Bob Mould release would not be far off the mark. Marrying cerebral pain with unrestrained melodies, the therapeutic plea of "Hold On" and slighted "Daddy's Favorite" tread too-familiar ground. Lyrically less dour than 2014's Beauty & Ruin, Patch the Sky bears its own bleakness as on the fraught with doom "The End of Things" and the cheery numbness of "Pray for Rain". Teetering between the crisp production and outright aggression that marked Mould's short tenure fronting Sugar, Narducy and Wurster push Mould ever closer to coming unhinged on Patch the Sky.